BAMAKO , Feb 13 2013 (IPS) - Soldiers belonging to the African-led International Support Mission to Mali continue to stream into this West African nation, as several hundred troops have already been deployed to secure towns across the country. Troops from Benin, Cote d’Ivoire and Senegal – representing the Community of West African States (ECOWAS) contingent of AFISMA – are among the recent arrivals in Bamako. According to a source close to the Malian Ministry of Defence, over 5,000 West African soldiers will be stationed in Mali before the end of February and about half of these have already arrived. The central Malian town of Markala is currently host to 600 troops from Burkina Faso. “We have felt safer since the arrival of the Burkinabé soldiers. They are based at the military school and have not given anyone any problems,” Markala Mayor Demba Diallo told IPS. “Hardly five minutes go by without seeing Burkinabé soldiers on patrol. They have secured the town and surrounding areas,” Diallo added. In the nearby town of Ségou, 250 Nigerian soldiers are stationed, while Togolese forces are stationed in San, a town a little further to the north. Troops arrived directly from Niamey and Niger to their base in Gao, one of the largest cities of northern Mali, which was recently liberated from Islamist occupation by French troops. France launched a military intervention in Mali on Jan. 11 at the request of the country’s interim President Dioncounda Traoré after extremists advanced on the town of Konna, 60 kilometres northeast of Mopti. Since April 2012 about two-thirds of the country had been occupied by Islamist rebels. Following the successful intervention, France now plans to pull its troops out by the end of March. Negotiations have begun to place ECOWAS troops under United Nations command. However, the BBC reported that United Nations official Deputy Secretary-General Jan Eliasson Tuesday, Feb. 12, said that the Malian government was “hesitant” to allow a U.N. peacekeeping force in the country. “To date, between 65 to 70 percent of the AFISMA contingent is now in Mali,” Colonel Yao Adjoumani, the AFISMA spokesperson, told a press conference in Bamako on Feb. 6. 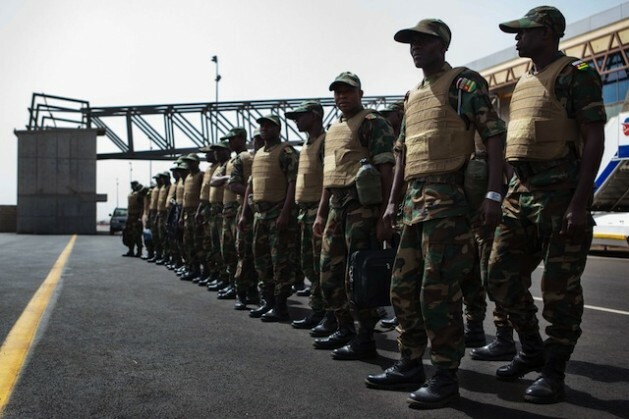 Adjoumani also announced that Guinean troops had crossed the Malian border, adding that the AFISMA mission will be fully deployed by mid-February. However, he declined to reveal the total number of troops, their stations and the deployment timetable, citing security reasons. Meanwhile, senior government officials have called for unity among the Malian army. Internal clashes rocked the Malian capital, Bamako, last Friday, Feb. 8, when gun battles erupted between the Red Beret units who support deposed President Amadou Toumani Touré, and the Green Berets who back the March 2012 coup leaders. The Malian army ousted the democratically elected civilian government last March. Hospital sources have reported that two teenagers were killed and 13 people sustained gunshot wounds during the fighting. The U.N. World Food Programme (WFP) has resumed the distribution of food aid to the north of the country. The organisation had stopped food aid deliveries following the outbreak of fighting in January. “Food deliveries to northern towns like Timbuktu, Goundam and Niafunké have started by boat,” the WFP communications chief, Daouda Guirou, told IPS. The opening of the Sevar-Douentza highway has made it possible to deliver food to Gao. “Food distribution to residents will begin shortly,” Guirou confirmed.